Have you guys ever had that moment when you think, "How did I ever live without this?". I've had that feeling a few times in my thirty-three years. *I was one of the last people I knew who finally got an I-Phone/Smart Phone. 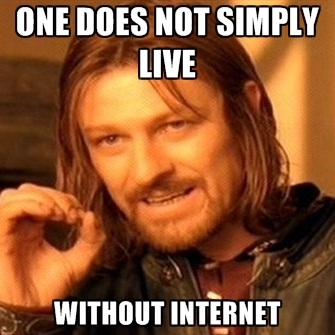 I remember thinking, "How have I been living without the internet at my fingertips?". Anyone else remember that feeling? *Our last car had a DVD player installed and prior to that every long road trip we took we held a portable DVD player in the front console area for the kids to watch. The installed DVD player was AWESOME! My kids could ride for hours watching movies. It made road trips so much easier! *With high school graduation money, I bought a desktop computer for college. At that point, it was the LARGEST check I'd ever written. I remember thinking, "WHOA". haha! #thosewerethedays Writing papers in my dorm room was SO easy with that computer. Don't know how I would have lived without it. Don't you know back in the day when people FINALLY got a television they thought, "How did we ever live without one?!" Right? THIS IS ME!! 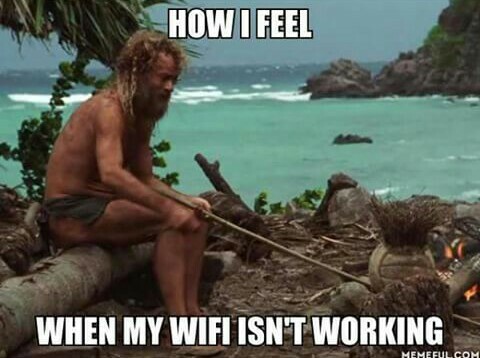 Our internet was out earlier this fall several times and I'd drive to Starbucks for the free wi-fi. I felt like I should saddle up my horse to get there. haha! For Christmas my parents got me a dust buster. You GUYS! A DUST BUSTER! I didn't have one. 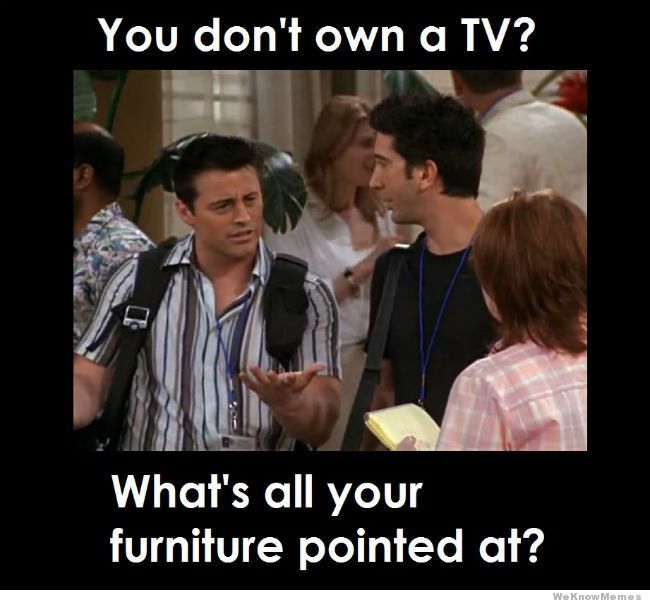 I have NEVER owned one!! But WHY?? Every night after dinner I sweep with a broom and dustpan. EVERY NIGHT! NOT anymore. I'll either spot vacuum the floor OR sweep and then vacuum it all up. Let me tell you that nightly chore is SO MUCH EASIER. Enough so that I thought, "WHY HAVE I BEEN LIVING WITHOUT THIS?!. I'm here to tell you. You need one of these bad boys in your life ASAP. Maybe for your birthday, Valentine's Day (because a dust buster SCREAMS romance to me ;)), or a Happy Monday present for yourself. ha! No matter the occasion, if you've been living without one, it is time! You need this dust buster/handheld vacuum cleaner. I'm sure you can't go wrong with any of them, but this is the one I got for Christmas. Let me tell you...life changing for this mama. Have you ever had that feeling? If so, PLEASE share with us what made YOU think, "How did I EVER live without THIS?!". I'd LOVE to hear what product has changed your life. Apple watch, that robot vacuum cleaner, Amazon Echo...please share! We'd all love to hear your faves! I would have for sure added this to my Favorite Products of 2016 post last week, but I hadn't tried it out yet when I wrote that post. Shame on ME! You were not actually using a broom and dust pan?!?! You need a dyson stick vacuum. Life changing. I have it and my dust buster out numerous times a day. I bought a bissell sweeper last spring, and I am not sure how we survived without it. I have thrown out my broom and dust pan. That sweeper has been life changing and made clean up so darn easy! Oh this has me giggling because I can so relate!!! Add in there my Keurig...one cup at 2pm why yes please! I seriously miss having a dust buster. I had one FOREVER and then it just up and died on me. Do you remember those sweeper things? It looked like a stick vaccum but wasn't electrical? You ran it over the crumbs and it eliminated them? Those are OLD school. I bought a black and decker stick vac and it can be used as a DustBuster too. Love it for my hardwood floors and my rugs! Megan...a STICK VACUUM? Why have I never heard of this? I didn't know a broom was so outdated. hahaha! Amanda...I didn't even think about coffee, because I've only become a coffee drinker post-Keurig. ha! I don't ever know how I lived without a straightener!!!! I have naturally curly hair and would just try to blow dry it straight--I am cringing at what my hair used to look like! High school I gave up and just wore it curly, but I finally got a Chi right before I went off to college. Now I would die if my Chi died haha! Haha...I love this fun post this morning!! I think I need to get a dust buster.. I was way behind on getting my first smartphone - and once I got one I can't believe it took me so long!! A straightener or a curling iron?? Without one of those, I'd be in trouble! Yes, it'll change your life!! You and me both!! Why did I wait so long? Haha! I love your love for the dust buster. There is simply nothing better than a clean floor, am I right? :) Mine is buying/renting movies on Amazon and watching them through the Amazon app on my TV? Did we really GO TO A STORE to buy/rent movies? That sounds like so much work now! Hahaha! That's a good one!! You're right! Why did we do that?!! Fun post! As a book lover myself and homeschool mama who loves ordering books for my kids I can't believe I ever lived without Amazon Prime! Seeing a package at my door in 2 days makes me so happy. �� Plus this year we did most of our Christmas shopping for the kids through Amazon Prime. It was awesome!!! I'm buying a dust buster today! And I remember actually thinking "why do I need a smart phone? I have a camera, a phone, a gps, and a laptop already." Haha! I don't know how I lived without Amazon prime!! Love it! A dustbuster - love it! My aunt got me one of these Conair hair dryers that has an integrated round brush - it makes styling my hair a BREEZE and whenever I use it my hair looks like I had it professionally done :) I live in fear of that thing breaking down!!!! How did I ever manage without it! I was gifted that same dust buster for Christmas, too! It's pretty great, lol! OMG, a dustbuster! I so agree with you. When people ask me what has been the most useful thing as a parent I say "A DUSTBUSTER!" It makes clean up so easy. I also like when my kids make a mess I can tell them to get the dustbuster and clean up after themselves. It's easier for them than managing the broom and dustpan! DVR! I actually watched commercials?! Couldn't live without it now! I got the exact dust buster for Christmas from my parents. My favorite part is passing it to the kids and letting them go at it!! For me the most life changing thing is DVR. Fast forwarding through commercials or even just recording a show was life changing. My kids don't understand during live TV how you can't skip the commercials. They dont understand how in back in the days you'd watch the clock to rush back to your dorm for your 7:00 bachelorette episode (trista anyone??). DVR--best invention ever!! Can't forget about TiVo! Oh how I love TiVo! Recording things on a VHS when I was a kid just sounds so ancient history now. I am right there with you on the dust buster!!! I used one for years and years, multiple times a day!! 2 years ago I got a Shark navigator during our Christmas gift exchange game and it has changed my life!!! haha I'm on my 3rd one now because I use it so much! I have one for upstairs and 1 for downstairs. It's an upright so you don't have to bend over, and works great on hardwood and carpet, so its great for the daily clean ups. I use mine many, many times a day!!! I just jotted dust buster down on my list of things I want for my birthday. 34 is going to be so much fun! I also sweep with a broom/dustpan every...single...night! Before kids I worked for Black and Decker and was in charge of the dust buster sales to walmart. I worked with the Walmart buyer to design the plans for where vacuums and dustbusters went in the stores. ha ha ha! And would you know I never use one??????? :-) I should change that! You MUST get s dyson cordless vacuum. I mean it's seriously life changing. I use it after every single meal (hello crumbs!) and it's just amazing. It's worth every single penny!!! We just bought a Neato botvac and it is life changing! It is sort of like a Roomba but you connect it to your wifi. You can be out and schedule it to start cleaning, or you can set it to clean at a certain time every day. They are pricey but life changing! That scene from Friends always cracks me up!! You need a Shark vacuum, dust buster and vacuum all in one. Amazon Prime makes me feel that way and so does remote start. Having a remote start on my car so I can always get in a warm one is not a necessity but definitely something I am glad to have! For Christmas, I received a crock pot that is Wi-Fi enabled and can be operated from their app on my smart phone. WHAT WHAT?!?! I was able to start my family's dinner from work without making the extra trip home at lunch. Life changing my friend, life changing. You will have to keep us posted on the battery life. Is it one that stays on a station and constantly stays charged? Or should you keep it off the station as to not ruin the battery life (this happens to the swiffer sweeper vac making it useless). Haha, I've wanted to get a dust buster, but haven't done any research on which one to get. I think you've motivated me to get one. I am fairly certain my kids will always drop food on the ground, which is baffling to me, how does it not make it to your mouth? like a whole french fry on the ground, how is that possible?! With you on the phone with internet, I got one just 2 years ago, I thought I was the last one to get one. My thing I can't live without is my Instant Pot, I just got it and it is seriously life changing! I was able to make a whole pot roast after work last week and it was nice to have a good meal after a long day of work! 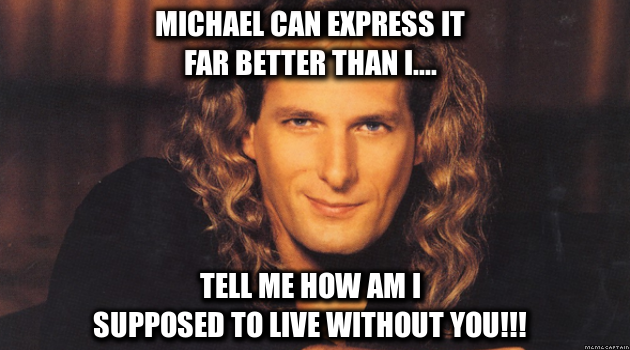 O to the M to the G, I literally just laughed out loud SO HARD at that Michael Bolton meme. And I'm at work. And now all of my coworkers think I'm crazy. My BFF and I used to crack all kinds of Michael Bolton jokes when we were younger, so I still crack up every time I see him. And yes, I feel you on the Dustbuster. I just got one last year for the first time and it is definitely life changing! I got a Dustbuster for Christmas too...AND I TOO LOVE IT. I had a word processor in college...and I still remember the late night printing sessions! Terrible! Roomba! Set the schedule and let it do the work for you. I have it vacuum every other day. It goes under tables and chairs and never gets stuck. I have thought of vacuuming in over a year. Well worth it. Recently discovered I can order books Online with my public Library card--- Life changing. I got a dust buster for Christmas too! It's the best!! I've cleaned up car seats and used it instead of the dust pan. It's a game changer!! I have that to same dust buster and it is awesome. I also love my cordless shark!! I mean why did I ever mess with a cord!?! Michael surprised me with the robot vacuum thing and it is AMAZING!!!!! I need to bring it over and let you give it a GO! We don't have a TV and we survive. We also don't have Netflix. We borrow DVDs from the library and watch them on our computers. I also don't have a smartphone. We live in the dark ages! Ha!